The book of Revelation is often misunderstood. Yesterday I decided to read the book in its entirety in one sitting—I rarely read whole books in a single sitting but I was compelled to do so. It’s actually turning out to be one of my favorite books in the Bible. I’m not too interested in making predictions about the future or “Armageddon” through interpreting Revelation. I’m much more interested in its message for the original readers and its message for us now. Revelation, as Craig Keen mentioned in our Theologies of Liberation class recently, is resistance literature. It’s a book for the poor and marginalized—it’s the literature of people who are persecuted and oppressed. It’s not primarily a book of codes for determining when Jesus will return. The book is primarily about exposing the oppressive systems which are in control for what they really are and affirming the suffering people for their faith and endurance, for the persecuted will become victorious. The first beast (Revelation 13:1b-10) is described as having “ten horns and seven heads, with ten crowns on his horns, and on each head a blasphemous name,” these blasphemous names may or may not be symbolic of the Emperors of the Roman empire (I don’t know much about symbols). The author continues, saying that people “worshiped the beast and asked, ‘Who is like the beast? Who can make war against him?’…He was given power to make war against the saints and to conquer them. And he was given authority over every tribe, people, language and nation. All inhabitants of the earth will worship the beast.” This sounds strikingly like a description of the Roman Empire—too strikingly not to be. Then there is a second beast (Revelation 13:11-18). This beast “exercised all the authority of the first beast on his behalf, and made the earth and its inhabitants worship the first beast.” The second beast causes “all who refused to worship the image [of the first beat] to be killed.” This beast is, as Craig put it, the Roman “Propaganda machine.” It’s the rhetoric which forces people to submit to the Roman rule and the Roman religion. It’s the social pressure to patriotism at the expense of the oppressed. It’s all that makes the Romans believe that they are the best and that through the victory of their sword they will conquer and bring peace to the world. Both of these beasts are eventually defeated through martyrdom. The way to defeat them is to be killed by them. This is seen throughout the book starting with the discussion to the seven churches, especially v.3:5 which says to the church in Sardis, “if you conquer you will be clothed like them in white robes.” The “them in white robes” refers to “those who had been slaughtered” v.6:9-11. So contrary to Roman thinking, Revelation says that through martyrdom people will “conquer.” This is extremely subversive language. This is also extremely challenging language for us. What if we simply replace Rome with any modern oppressive government? What if we say that the first beast is some world power which consumes the worlds’ recourses at the expense the poverty-stricken? And what if we say that the second beast is that country’s propaganda machine—its media, which controls the actions of its people and, in at least some fashion, exercises the authority of the oppressive government? Then the message of Revelation becomes a call to us to martyrdom on behalf of the poor, or as the poor. Then the message of Revelation is a call for Christians to lay down their lives… you figure out what the implications of that may be. There is one more character worth discussing—a whore (Revelation 17:1-18:10). 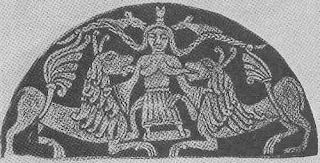 The great whore of Babylon is seen “drunk with the blood of the saints and the blood of the witnesses to Jesus.” It says “the seven heads are seven mountains on which the woman is seated.” Interestingly enough, on Roman coins there is the depiction of a woman seated on seven mounds. Is the woman money? It continues, “The woman you saw is the great city that rules over the kings of the earth.” But is she really a “city”? “And the kings of the earth have committed fornication with her, and the merchants of the earth have grown rich from the power of her luxury.” Basically, the whore is the means through which the oppressor becomes so rich and so oppressive. God cries out to His people, “Come out of her, my people, so that you do not take part in her sins.” The way to defeat the whore is different than defeating the beasts. The way to defeat the whore and to not be destroyed by her is to avoid her—to not take part in her. After all, it is by fornicating with the whore that the beasts eventually, at least at some level, destroy themselves. The whore is the oppressive economic system which causes some to oppress others. The whore is the Roman economic system. But what if we, again, replace Rome’s economic system with some modern version of it? What if the whore of Babylon is some economic system which causes rich people to get richer and poor people to get poorer? How can we refrain from participating in it, especially when we ourselves may be caught up in it? I guess the best answer may be experimentation. The early Christians experimented with boycott of work for one day a week, refusal to participate in military, celebration of a communal meal which included people of high and low classes. There are those today who choose to boycott certain things, refrain from certain occupations, and/or live in true communities sharing everything with one another. These experiments sometimes get so creative it’s dangerously close to art. Tough it’s sometimes difficult to see whether or not these experiments are effective. There is a quote by Aloysius Pieris that has been on my mind for a few days in regards to this—“Even if that experiment seemed to have failed, it was an experiment worth failing; therefore it is an experiment worth repeating until it bears the fruit…” (Daniel G. Groody, The Option for the Poor in Christian Theology, p.274.) If we wait too long see which experiments will be “successful” or the most “successful” we will be caught up in fornication with the Whore of Babylon forever. We must realize that there are experiments worth failing. A beast, a beast, and a whore are still teamed against us today. What can we do together to lay our lives down against these beasts and to avoid this whore?